THERE cannot have been grander weddings on celluloid – almost everything Priyanka Chopra Jonas did this week has had more than a touch of the cinematic about it. 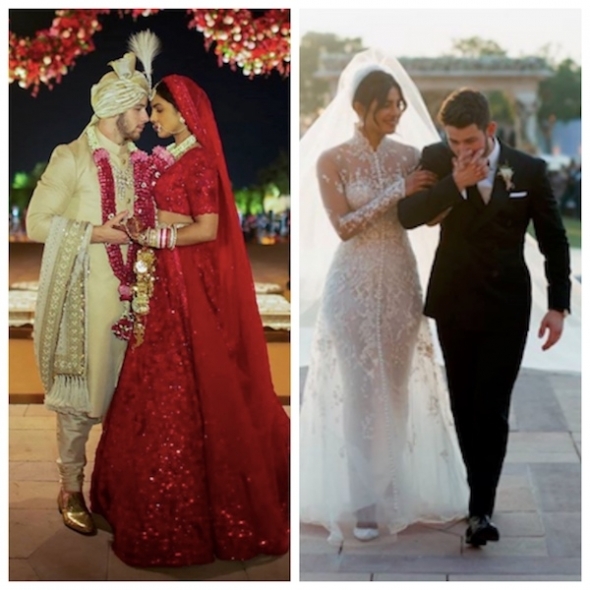 If you have been living on Mars, you could be forgiven for not knowing that Bollywood starlet and now US-based Priyanka Chopra has tied the knot with American beau, Nick Jonas, one part of the musical trio, the Jonas Brothers. Earlier this evening (UK time), she changed her Instagram moniker to Priyanka Chopra Jonas in light of her recent nuptials. And the first pictures of her front cover of Vogue in 2019 were released and with them a couple of inside magazine shots by famed celebrity snapper Annie Liebovitz. The couple were married over the weekend in Jodhpur, Rajasthan in both Hindu and Christian ceremonies. There was an appearance at the launch party of the dating app, Bumble in India, in New Delhi (Chopra Jonas is an investor and advisor), where India’s Prime Minster Narendra Modi greeted them and bestowed his blessings. A story that was highly negative about the two’s love affair was pulled after Chopra Jonas’ in-laws (and prospective ones), sprung to her defence and accused the publication of peddling racism and falsehood. The wedding celebrations look like something out a beautiful cinematic fairy tale and Chopra Jonas has played a blinder – credit to her and new hubbie – this is going to be some love affair and wedding to surpass. And it’s a romance that just keeps on giving… She is best known in these parts (India, that is) affectionately as Peecee. The next big wedding is that of mega tycoon Mukesh Ambani’s daughter Isha. She is set to wed Anand Piramal and pre-wedding celebrations are all set to hit Udaipur with a bunch of charter jets ferrying guests from Mumbai to another of Rajasthan’s stunning wedding locations. HALF the country is consumed by a film called ‘Robot 2.0’ or that would have to be the conclusion of anyone registering that this film has already made some £50 million in its first week of release. It still has a little way to go to make money (reportedly it is India’s most expensive film to date, costing around £75m), although as the weekend approaches that hardly seems a thing. 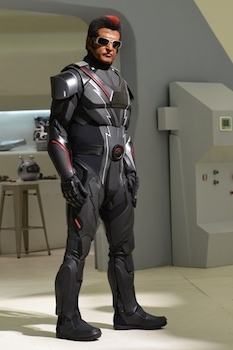 The film’s UK publicists tell us that it is heading for 52,000 screens across China and it will be the biggest 3D release of any foreign film in that country. Starring a legend and icon is his own right, Rajininikanth (as pictured above), the famed South Indian film star (who made his name in Tamil movies), it pits him against one of Bollywood’s biggest names in Akshay Kumar. There is also a spot for Brit Amy Jackson and surely represents her most high profile film role in an Indian film to date. Solidly working now for more than five years in the Indian film industry (largely in the South), she has an increasing international pedigree with a spot in the US TV series, ‘Supergirl’. It has healthy sales overseas too, making more than £10m in its first week abroad. Experts expect it to surpass ‘Baahubhali’ the other film which cost more than £50m to make and went onto break cinema receipts both at home and abroad. A few days ago, it was announced that ‘Baahubhali’ would get a screening at the Royal Albert Hall in London with a live orchestra accompanying. Sounds amazing. THERE has been some heat generated by the film, ‘Kedarnath’ which releases here Thursday (December 7). And not just because it features Sara Ali Khan, the daughter of icon and star, Saif Ali Khan. FINALLY captured on camera here above, the ephemeral Tabu was interviewed on NDTV (one of India’s leading TV channels) tonight. In a wide-wide-ranging 30 minute spot, she spoke a lot about the challenging films she has done and citing Vishwal Bhardwaj’s ‘Maqbool’ based on Shakespeare’s ‘Macbeth’ and ‘Haider’ inspired by ‘Hamlet’ but transposed to the troubled Kashmir of the 1990s, as among her most challenging films. She continues to strive to challenge herself – so don’t expect her to do anything straightforward any time soon. Interestingly, she has again attracted the limelight because of her role in ‘Andhadhun’, a black comedy, in which she is among the principle characters. Not a traditional Bollywood film, it is about a blind pianist (Ayushmann Khurrana), who has to report a crime he never actually saw… the film, directed and co-written by Sriram Raghavan, made a big splash both at the box office and critically. *After Goa and International Film Festival of India (IFFI), we headed here for family reasons. Now, we will be back on the road and the film festival trail, join the bird in Macao on Saturday (December 8) for the opening of the International Film Festival and Awards Macao (IFFAM).